Space Safety » Archive » Spaceflight » Space Medicine » Houston? Where is the closest Hospital? In several episodes of the Star Trek series, Dr. McCoy, the very crude chief medical officer onboard the USS Entreprise, refers to medical professionals of our times as people from the dark ages, far from the extraordinary capabilities of the doctor’s medical bay. While Dr. McCoy might show disdain in the way our medicine operates, risk management and health standards is taken very seriously by our 21st century space agencies. To assess these issues, the institute of medicine of the United States, part of the National Academy of Sciences is releasing a report ordered by NASA on the Health Standards for Long Duration and Exploration Spaceflight that invites to explore the difficult issues of risk taking in space exploration. Thanks to the extraordinary progress of the last centuries, mankind is now a spacefaring race. Still not going very far from home, but travelling through space nonetheless. Going into space is largely described as an adventure. The powerful roar of the large engines blasting through the sky, the unimaginable speed achieved by your vehicle, the magnificent panoramic view of our small world, a day filled with dozens of sunsets, all of these experiences are by all means out of this world. All of these experiences point to excitement, but with excitement come also danger. An engine can fail, a reentry can go wrong, a space debris might crack open your panoramic window. But one of the most pressing concerns of mission control is for an astronaut to catch the flu, or worse. How Safe is Living in the International Space Station? While it might seem as a place very close to home, flight proven, and under control, the International Space Station is already a dangerous place when it comes to guaranteeing the well being of astronauts. It may come as a surprise to many, but the probability of the International Space Station being hit by a debris or a micrometeorite that will actually penetrate the pressurized habitat is over 50% over its lifetime, a worse chance than tossing a coin. While debris avoidance techniques have been improved over the years, the older the ISS gets, the higher the probability of a failure. As for any sailor lost in the middle of the ocean, it is impossible to provide a quick response to a medical emergency other than the means that are available onboard the ship. For any sort of medical emergency, time is the key, studies from accident of civil and military aircraft accidents show that if an evacuation cannot be organized within the first 24 hours after the accident, the life expectancy of the injured survivors goes below 20%. So far, with the exception of the Apollo Program, the space missions have been focused on sending humans to low Earth orbit. Since NASA is planning on longer and farther missions in the near future, it requested this independent report to analyze the ethics involved in setting up health standards. As the level of safety for a flight to Mars is significantly lower than the current standards and as a trip to an asteroid is very close to the limit of the current acceptable standards, the question is raised of whether we may lower these standards and, if we can lower them, how to lower them. During his walk on the Moon, Jim Irwin (pictured here) developed the earliest symptoms of a heart condition. 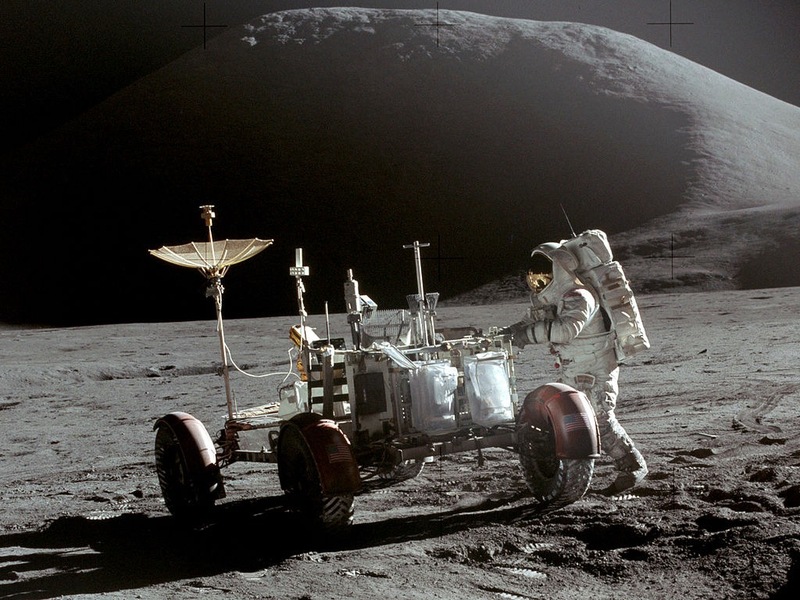 A heart attack on the Moon would have been fatal not only to Irwin, but also to commander David Scott, as he would have been unable to pilot the LEM alone. – Credit NASA. Standards exist in a great number of fields, from the size of your door to the way your phone communicate with its network. Health standards are used to “protect individuals engaged in specific types of work or activities”. They exist for almost any kind of jobs, from being exposed to the heat of boiling plates in a kitchen to navigating on a nuclear submarine. For any specific human activity, a number of health standards can be defined and they are a useful help for researchers, managers, regulators and engineers since they indicate where efforts should be done in design, R&D, or where to strengthen the rules. In any activity, the comparison of risks and benefits is usually a help to create a standard. This is called a risk to benefit approach. It can be presented a follows: to expose someone to a higher health risk might be worth it if it can bring a great deal of benefits. For instance it might be worth letting 007 dismantle a ticking nuclear bomb unprotected if it can save the world from doom regardless of Her Majesty’s spy being exposed to radioactivity. But as presented in the report, a risk to benefits approach is not enough, and an ethical framework is needed on top of this. To carry on with examples, it might be logical to force someone to sacrifice himself for the so-called greater good, but that could be unethical. As the Committee on Ethics Principles and Guidelines for Health Standards for Long Duration and Exploration Spaceflight started its work, they found no ethical framework that was directly applicable to long duration spaceflight since most dangerous professions (submarine workers, nuclear plant workers, and so on) have some similarities with astronauts on long duration missions but are not directly comparable. They therefore had to build an ethical framework from scratch that would be the basis to their study on how to manage NASA health standards. Ehtics are going hand in hand with morals. What is ethical in one society might not be ethical in another, and that stems from the basic moral values that a society applies (or try applying) to itself. Killing a local ecosystem to build a dam would seem unacceptable in one society, while it would be considered necessary if the dam would bring water to a region experimenting drought. Over the last centuries quite a few very bright minds have been working on providing philosophical theories that are aiming at being applicable to all things. One could for instance take as a referential the European liberal movement of the 17th century laying down the foundations of the right of the individual, or the communist philosophy of Karl Marx back in the 19th century to try to find a framework applicable to an entire society. Grand theories on how mankind should organize itself to elevate closer to perfection are numerous. None have ever worked fully in the real world, and most societies that tried to apply a single theory to themselves have experienced great difficulties. As we can see, it is quite difficult to make up a philosophy that anyone would agree on that covers it all. Therefore the usual successful way forward in finding rules everyone can agree on is to try to extract the best of all theories by keeping basic and mid-level principles intact and getting rid of all the rest. Most philosophical theories would agree for instance that everyone should be free, regardless how they propose to achieve freedom. Have fidelity, (the individual sacrifice of the astronaut should be recognized as such by NASA and society should provide for their care upon return – especially health care). Space radiation is the major medical hazard in long-term space exploration. This very simple and basic set of rules needs then to be implemented in a dedicated framework applicable to all NASA policies aimed at updating manned space exploration standards. The first step is to decide which missions that are unlikely to meet current health standards are ethically acceptable. In other words, some missions that are currently studied (say, a mission to Mars) might not fully comply with the current standard. Before lowering the standard for this particular case, it should be determined if it is ethical to do so. All other missions that do not meet current health standards and cannot be ethically justified will need to be postponed until risk mitigation strategies can be found that will make a lowering of the standard for these missions ethically acceptable. Be launched with sufficient guarantee that astronaut will be well treated upon their return by society (create provision for their healthcare, for their retirement, etc.). Once the criteria are decided upon (these could be settled once and for all) they will be applied by reviewing mission proposals and trying to judge fairly and precisely whether or not to lower the standard for these missions. How Do We Handle Medical Emergencies In Space? Lowering the standard should only be done on a limited basis. To lower the standard globally would open the door for giving up on the standard. Once it has been decided to lower the standard for a specific mission, the next logical step is to decide how much you want to lower it. The creation of a new, lower standard for a specific context should not be contemplated as a way to accept anything. The new standard should be created by an independent panel keeping in mind the well-being and the safety of the astronauts, so to limit the adverse effect of lowering the health standard. If the new standard cannot be met by the mission concept, scientists and engineer will have to do better, but the top management at NASA and the panel in charge of lowering the standard should avoid any further step to lower standards based on incompatibilities found after the new standard has been outlined. In addition to this very important role from NASA manned program top management and from the panel in charge of the health standard for this specific mission, it should also be noted that the selection and training of the crew should take it into account. The crew members have to be informed in a transparent way and have to make their decision of accepting the assignment in an independent fashion. The relation of trust between the agency, the engineers and the crew members can only be built with everyone knowing how much risk this mission will involve for the crew. While it is clear that the crew members are the one bearing most of the risk, it is also necessary for the designers of the mission and the members of the program to know how much is at stake. Going to outer space is a dangerous business. While we understand that the ultimate future of mankind will be decided away from Earth, we are still far from enjoying the same success rate in space travel as in air travel. Spacecraft design is a science almost 50 years old, and while much has changed in 50 years, the energy involved in sending an object into space is still breathtaking. Space is one of the most inhospitable environments known to man, and traveling over extended distances adds to the complexity. Many people, including myself, believe that risk is an inherent part of any endeavor, and even more so if you are exploring unknown places such as outer space. Risks need to be taken for any enterprise. But man is an intelligent race, so much so that one of the first things we learn as children is to understand risk and to measure them to the potential value of taking them. Our entire society is based on the simple thought that one can measure a single equation: the ratio between risk and success. This state of mind even took the name of this equation: it is called being rational. As an engineer, I like to solve problems, and sending someone to Mars is a very complex one. But as complicated as it can be, I am confident that this problem can be solved and that it will be solved eventually. On the other hand, sending humans on other worlds is a responsibility that is shared by humanity collectively and even more so if you are part of the program. I believe that lowering a health standard is the admission that engineers and scientists have failed to provide a suitable solution for the problems linked with the mission. This is already a bit unethical, but should we come to such an extremity, I very much hope that the findings in this report will be used and that we will send people out there at greater risk not for petty discoveries but for important and valuable goals.